To ride a motorcycle is to instantly gain entry into an exclusive club. 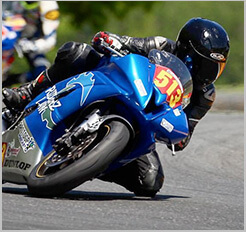 You could be a fulltime professional superbike racer, but if you're caging it on the road no one will look twice at you. On the flipside if you're riding for the first time on a brand new to you motorcycle you'll immediately find yourself being greeted by waves and nods from other riders on the road. Maybe that's a difference between motorcycle riders and 4 wheel vehicle drivers, is the pretention and isolation. Sportbike riders wave to cruisers waving to dual sport riders. Everyone is ready and waiting to give a headtap for danger or the low wave for "just saying hi". It doesn't matter when, where or what the ride. Good luck finding such a community among drivers. Just about the only time cagers interact is when they're swapping insurance details or are reacting to something someone did that put them in danger of doing so. Something I love about commuting on a bike are the "flash rides". Pulling up to a stop light with another biker, keeping pace when the light turns green, breaking into staggered formation in the carpool lane…these are all symptoms of flash riding (if this becomes an inconvenience, ask your doctor if caging is right for you). 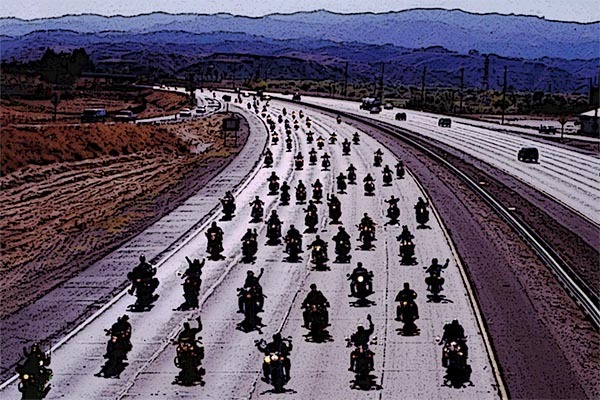 Some mornings I'll find myself a part of a gang of three or four riders all headed up the 405. None of us know each other or where the others are going, but it doesn't matter. For that part of the day we're sharing something; part commute, part pleasure…I call it a flash ride. How you refer to it is unimportant; what's relevant is that it's both safer and more enjoyable. So when you're out on the road and see a small group riding your same route, jump in with them. What can appear to be an organized ride may just be a mixed and matched group of riders sticking together while going about their daily chores. We're social creatures after all, no matter how hard some of us try to fight it.